The Frontier Turning System is a controlled airflow and complete mixing system. 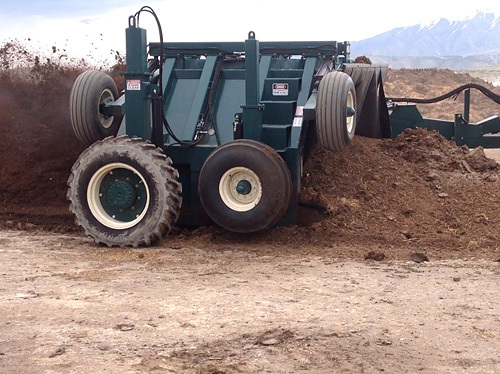 Old style straddle turners using flat paddles, knives or rototiller tines were somewhat effective in transforming organic waste from an environmental problem to a more benign product. But with the ever-increasing costs of fertilizers and other soil amendments making high quality compost is fast becoming a viable source of income across the country and around the world. 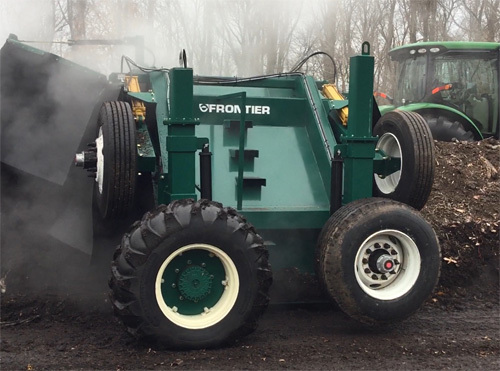 Every Frontier Windrow Turner is designed to perform every task required to maximize bacterial and fungal activity necessary to produce odor-free valuable compost. This is not an empty claim, a myriad of satisfied customers around the globe are telling us so. 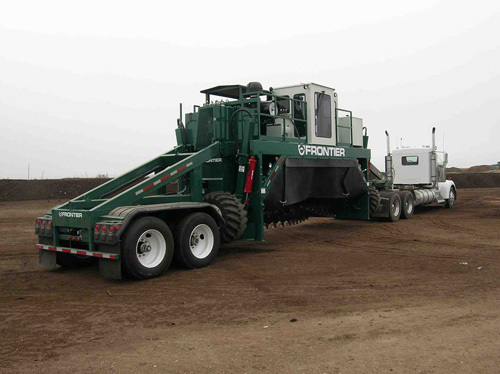 The Heart of the Frontier Turning System is found in every Frontier Windrow Turner from the largest to the smallest. They all create a directionally focused Gale-force airflow. Named in memory of our long time mentor, Mike Kenagy, who was both mighty in stature and mighty in spirit. 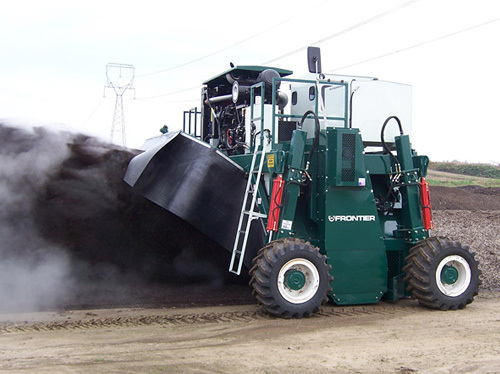 For over a decade, the highly popular Mighty Mike has made superb quality compost, worldwide. 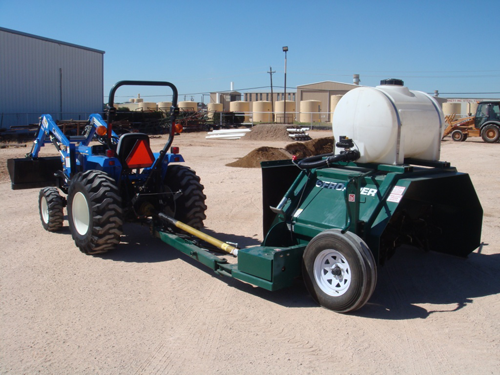 It has a proven track record as a highly productive and low maintenance workhorse. A highly effective and low cost turning solution for mid to large size sites. 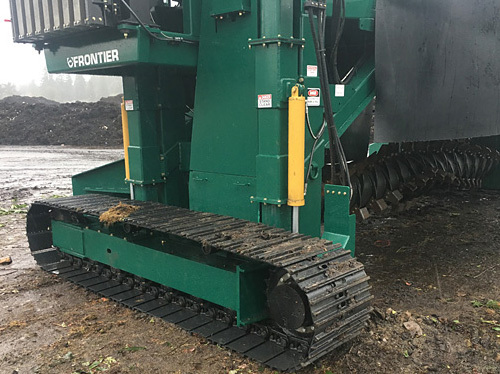 High powered, efficient drive trains with simplified hydraulic and electrical systems put Frontier in the lead with customer satisfaction. Far wheel assist is a very important feature on a Frontier tow behind turner. This traction tire pushes the far side of the turner forward to keep up with the tractor. The speed is adjustable from the tractor seat. Performance of a Frontier far wheel assisted tow behind turner approaches production levels of a self-propelled turner. Fast and easy switch from work mode to trailering mode make these machines mobile in just minutes. Large excavator style tracks have proven performance. They provide great flotation, traction, power and maneuverability. 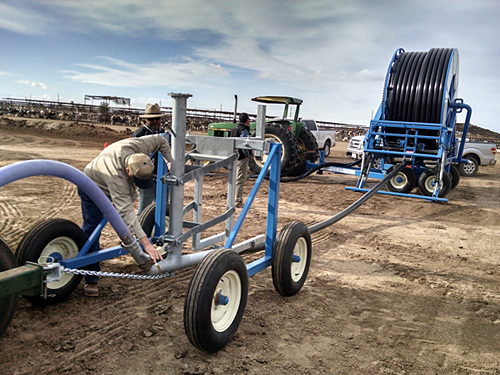 Our innovative reel watering systems supply unlimited water to the turner. Water windrows up to 1600 feet with ease.